They sound so simple but they pack quite the flavor punch. These little potatoes are just the perfect side to a yummy entree…we hadthem with steak. I think chicken or fish with these would be nice as well. They are so easy to make and bake in the oven when you have something to throw on the grill. These disappeared in one meal without incident. 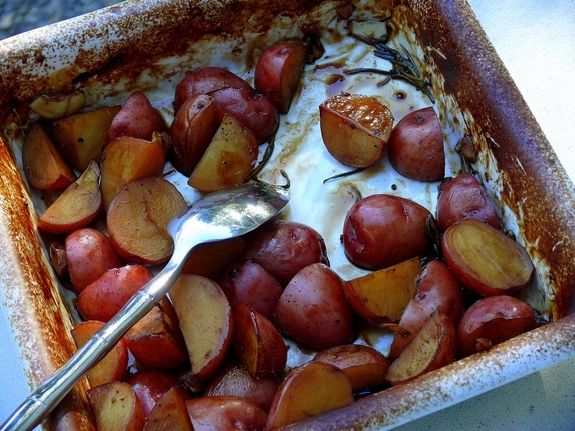 I know all you potato fans will gobble these up and make them again and again….you’ll see!! Preheat oven to 425o F. In an 8″ square baking dish place potatoes evenly along bottom. Add broth, vinegar, garlic and rosemary (or thyme), season with salt and pepper. Bake until potatoes are tender and liquid is reduced to a glaze, about 50-70 minutes (mine took 50), tossing 2-3 times. 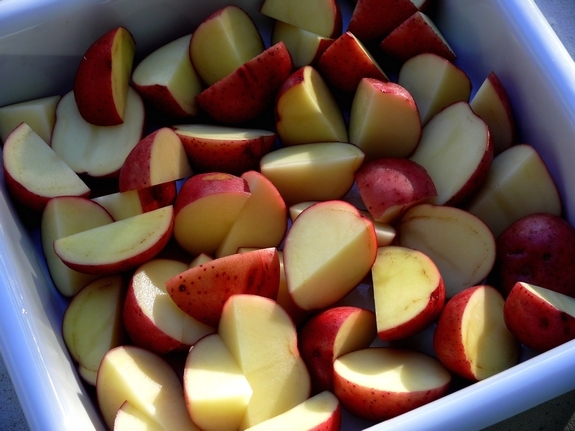 Preheat oven to 425o F. In an 8″ square baking dish place potatoes evenly along bottom. Add broth, vinegar, garlic and rosemary (or thyme), season with salt and pepper. Oh yum!!!!! Those look amazing! I have a flank steak that I’m going to grill this week and these sound like they’d be perfect to accompany it! 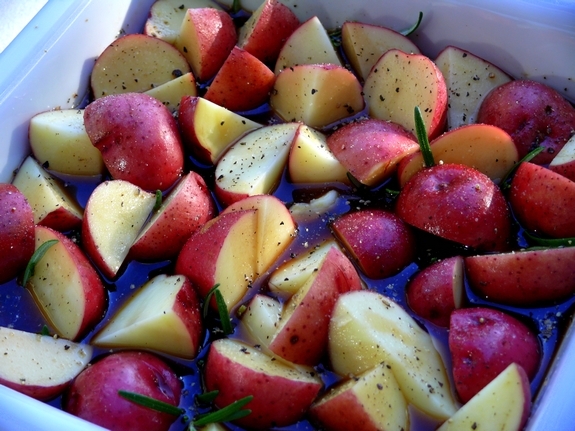 Wow, this sounds heavenly, I use balsamic to glaze tomatoes, but never potatoes. Oh what a great idea, I bet they DO pack a flavor punch! If it weren’t going to be 97 degrees for a high today, I’d make these tonight. Think I’ll wait until it’s a bit cooler cos these look awesome. Love how simple and yet how delicious these tatties look! Tasty Man Tasty!!!!!!! Just the right amount of zing. This gives roasted potatoes another whole dimension. Thanks. These potatoes look delicious and easy to make. I’ll have to try them out soon. I love making potatoes similar to this with roast beef or chicken. I’ll have to try your spin on them. I’m cooking these right now. Going to eat with some wild salmon. They smell amazing. Thanks for the recipes! I needed something to go with tonight’s salmon. I had all the ingredients, score! Thanks. Wow, the potatoes look fabulous. Th Spud Queen strikes again!! 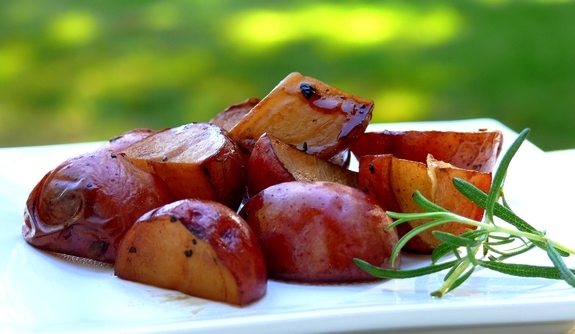 Balsamic vinegar adds such great flavor…what a super idea! Good idea! I actually have a basket of new potatoes that I need to do something with. Wow, yum! Love this idea. Great idea. Good variation on a classic. What don’t balsamic and garlic taste good on? Oooohhhhhh my goodness! I LOVE balsamic vinegar and have been known to sip it right from the bottle! I am making these potatoes ASAP! These look absolutely divine! Thanx so much for this wonderful idea! Good potatoes! I threw in quite a bit of garlic, and that was delicious as well. I think I’ll make these again. I just want to let you know that I made these potatoes and the five-spice tilapia for dinner for my boyfriend and I the other night, and they were both fabulous. I was really pleased because my boyfriend has a bit of a picky palate, but he loved both dishes, especially the fish. Thank you so much! These are also very good in the winter made with russets.